Take a stunning ride along scenic highway M-134, 25 miles east of Cedarville to historic DeTour Village. 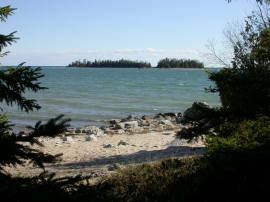 Along the way, there are many gorgeous stretches of beach and forest, much of which is open to the public. The Cranberry Lake Flooding area and trail, and the DeTour State Forest Campground provide outstanding opportunities to see the woods and water. Be sure to walk along St. Vital Point, which can be accessed through the DeTour State Forest Campground by heading east along the shore. Additional parks can be found upon reaching DeTour Village, home to quaint shops, a marina, grocery, hardware, outfitter and tackle shop, restaurants and other services, as well as the ferry dock for the Drummond Island Ferry service.